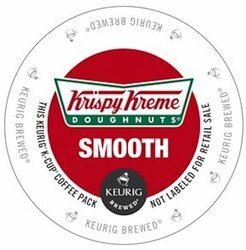 Krispy Kreme Coffee - Smooth - K-Cups. A balanced, easy-to-love blend that boasts bright fruit notes and a clean, sweet finish. Each box contains 24 single serve K-Cups for office coffee.